I was always impressed by great design and look of certain apps and websites. It started back in the day when derbauer was the best Flash website on the market. Lately I’ve got very impressed by Airbnb’s design as well as Pinterest’s content, which is just outstanding. 1. Houzz.com – A collaborative platform for home remodeling and design, bringing homeowners and home professionals together. Very visual….very interesting…so many cool ideas. 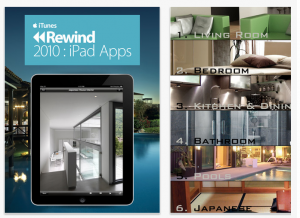 Quite a bunch of pics about your home with intuitive UI. You can zoom in, fade away the tiles, so pretty seamless and fast scrolling through tons of pics. Also a free version with a few pics exist. All about garden sheds, garden design with youtube videos and instructions. Great resource! Last month I flew to Europe & rented a brand new car (Ford Mondeo) for 31 days and just used my Credit Card for coverage as well as the standard insurance coverage provided by the rental company. What I didn’t expect is the fact that I got into a hail storm in Austria (see pic below), which was so bad, that the car was covered with dents all over the place and I now will probably get invoiced $1k, which is my deductible for the car. You probably start laughing a bit now. But let’s calculate: With additional full coverage with no deductible the insurance would have added about $20 extra per day, which would be $620 for the full month.Overall savings would have been ~$500. So yeah..makes me feel better, but still bad. I was wondering now what I should do for my next business trip to Mexico. Should I get a Mexican insurance on top? I think so. The reasoning is just clear: 1. Insurance to go south of the border is just much cheaper than insurance in Europe 2. I won’t be travelling for 30 days plus. 3. 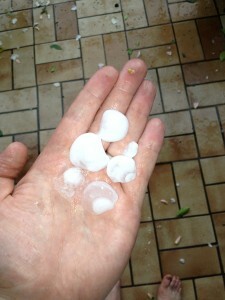 The chance of the hail storm is unlikely, but cars getting stolen is just too common in Mexico. 4. Deductibles are very low. 5. My Iphone is included in some insurances, so the extra coverage should help. Would you insure your car and phone when traveling to Mexico? Would you insure only one of them? 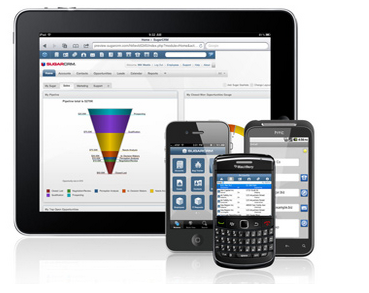 Oracle’s Mobile CRM allows to manage key customer relationships data. It integrates with on-device calendar and contact applications, but limited to the iPhone only. Great advantage of the software is the fact that it is extandable and customizable. Initiated was this mobile effort a while back when Mr. Charles Phillips was in place. It allows clients to always stay on top of customer issues, keep tabs on the latest performance KPIs plus allows to fine tune service operations so everything keeps running smoothly. 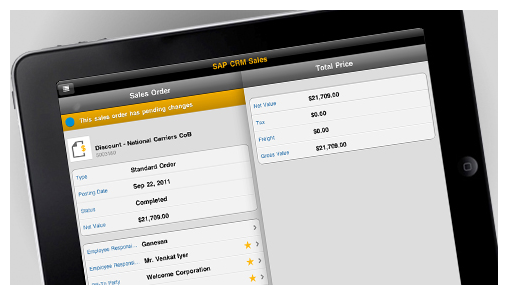 First of all it is to mention that the SAP Mobile Solution is powered by the Sybase Unwired Platform. 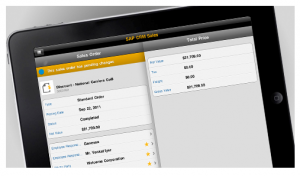 It aims to reduce call planning and execution times by allowing to create quotes and orders on the fly. What’s also a big differentiator to Salesforce or Oracle ist the “Near Me” functionality just like Sonar. What’s also great is the fact that it allows collaboration and other features to close sales. Sugar Mobile Plus: Sugar Mobile Plus gives users access to Sugar data from their smartphone or tablet via a native application with offline sync capabilities, which also stores a copy of the CRM data securely on the mobile device. 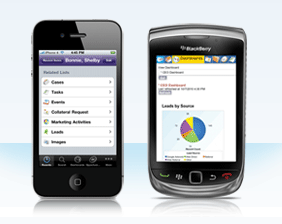 Sugar Mobile Plus is available for BlackBerry, iPad, and iPhone. Similiar to website building company WebStarts more and more companies are considering developing mobile websites without having extensive knowledge of the mobile space. Wix allows business owners to build and host mobile websites for free. This company is one of the few companies that offers free templates and free hosting. The options are tremendous for companies with limited budgets. Companies can now afford to launch a website for mobile applications without paying a web designer an additional fee for the functionality. Wix will guide business owners through the process of building and hosting the mobile website.There are over 100 different customizable templates to select for the mobile design. There is even a template that allows users to build the website from scratch. With mobile shopping cart technology and increased visibility, business owners have nothing to lose. Google Sites allows users to build their mobile websites in minutes instead of days. 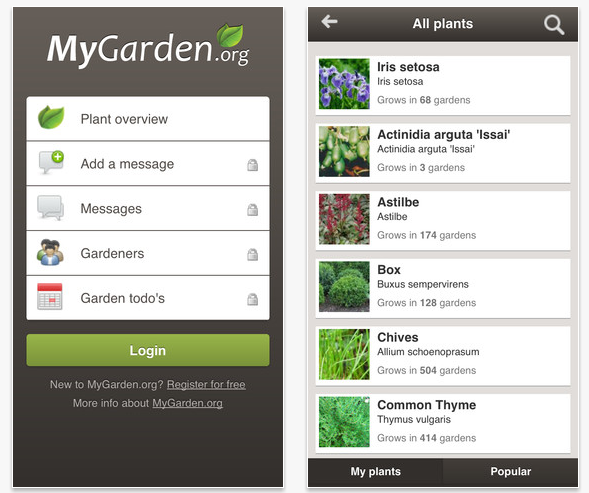 Since Google Sites is free, there is nothing to lose by building a mobile website. The process is simple and easy-to-follow. If your company already has a primary website, GoMo will evaluate your existing website and make recommendations for improvement for a mobile website. Once the website is built, website builders can evaluate the effectiveness of the mobile website.There are several different templates available to address a variety of industries. For instance, there are pre-established mobile templates for restaurants, lead generation, local business, eCommerce and social. Customized mobile websites are also available. Users may choose from over five different template colors. Wapple empowers its users by providing tools to assist with mobile website design. The company ensures that mobile websites are optimized to perform on every mobile platform on the market. Wapple mobile site builder software is award winning.Users have the opportunity to take advantage of a free trial, but there will be some charges assessed after the trial is complete. Wapple professionals offer customers a full range of mobile web services which include: creative guidance, design, website development, marketing, consultation and assistance with deployment. Tutorials are also available to guide users through the process of mobile website development. GoMobi recognizes that business owners depend on the revenue from the mobile web to survive. GoMobi provides services to ensure revenue increase once the mobile website is developed. The company assists customers by ensuring that the mobile website renders properly across 9,000 different mobile devices. GoMobi allows users to use customer feedback and data to build websites tailored to each customer’s feedback.Since GoMobi sites are hosted in the cloud, accessibility is easier. Changes can be made from any location anywhere with minimal effort. GoMobi incorporates many features to make the process of mobile website development easier. The development process is easy enough for even a non-technical person to understand. Your Company Cannot Afford To Delay Mobile Website Development. 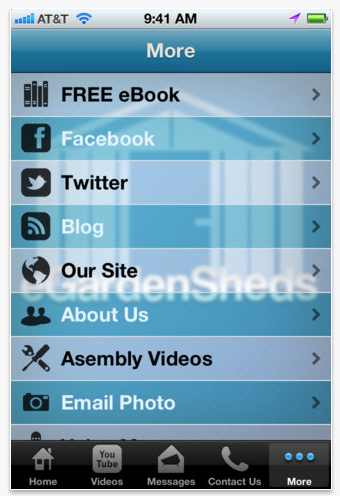 Select a mobile website builder software to meet your company’s needs. With the number of dollars generated from mobile transactions, companies cannot afford to not claim their portion of the market share. Consider how mobile website builder software can help your company build a mobile website that will help your company achieve their mobile revenue goals. I’ve been waiting to make a trip to Italy for a while, but finally decided to visit Rome this summer. It’s not for business or a mobile expo, but I am still going to be excited to see how a country that lives outside will use the mobile phone. My extended family and me will be staying in the Vatican quarter. Not in a hotel, but rather at a residence roma. We were neve thrilled to stay in an 80ties hotel for $200/night, so an apartment complex will be it. What’s great about rented apartments is the fact that I can bring my kids and cook our own meals without feeling awkward. The apartment also has free WiFi, so I don’t need to pay for it every day and beg the hotel to set it up for $30/day. Last..the apartment complex we picked has a gym and in striking distance to the Vatican and all the other beautiful things that I haven’t seen. This will be my first time in Rome and after reading 3+ years Latin books in school I finally made my way over there. With the advent of mobile web usage, more users are accessing the Internet from many more types of devices than ever. This has created a need for business owners to employ mobile web design strategies for their websites. Web design companies have always created different strategies, depending upon the type of project they are working on. Now that the mobile marketplace has exploded, every website design needs to have a way to function adequately in the mobile web space. Even very straightforward websites need to include a thoughtful approach for the mobile experience. The screens are smaller, so the content needs to fit that space well enough so that users may access it adequately. Whether it happens to be a content driven, e-commerce, or interactive application, each website must incorporate a strategy that easily engages the mobile customer. There are critical aspects to mobile webdesign that differ from traditional sites. Mobile web designers, developers and web site owners all need to consider the process and strategy before beginning to construct a new website. Many websites need to be adapted to include the new design components. First, mobile webdesign companies should thoroughly understand their client’s business objectives and how they will relate to the mobile website. Secondly, those objectives need to be prioritized and implanted into the design hierarchy. For existing designs, these objectives will need to be translated to a mobile sensibility using specialized parameters. To that end, the mobile webdesign company focus will be limited to top objectives, since there is a limited space to work within. Study tracking so that the development and design incorporates this very key data. Coordinate the branding strategy so that it is in sync with the marketing message. This is very important, as the brand will be the most recognizable aspect that the mobile website will need to convey. Consider the browsers and devices being used by visitors. Build the site keeping focused on device support. Target the browsers through the development, test and launching phases. Optimize the mobile webdesign site to cover the varied landscape of browsers available. Mobile web designers should simplify whatever is possible, to keep load times and file sizes under control. However, mobile webdesign companies should still be able to create compelling websites. For example, there are tools to effect drop shadows, rounded corners and gradients that are customized for the smaller screen and lessened download speeds. Technically speaking, mobile web designs do well with single column layouts. This structure helps manage space limitations and to scale for the different resolutions for each device, particularly for landscape and portrait modes. The mobile web designer should scale the font sizes for reading ease and adapt for clickable elements such as buttons, links and menus to convert them to tapping. This will mean using larger buttons which may be pressed easily with fingers and the thumb. Also, there are various sizes of hands to account for. Ensure that a button or link changes visually to prevent user confusion. Visual feedback is essential for mobile web design. Consider loading images that are animated so that it is obvious that an action is in process. For example, engage a spinning top picture as subsequent pages load. 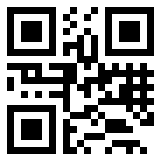 Try the mobile website on many devices. You can do this by installing a developer SDK for platforms such as Android iPhone or emulators on the web to accurately review how successful the new sites are. The most important thing that mobile web design companies may do is to prepare for and be accountable for each component necessary ahead of time, to launch the most effective mobile web site possible. So we’ve been testing a few Forex apps for the Iphone lately and wanted to give a bit of an overview of what you could use for your trading needs, news or forex analysis. What we liked about Forex.com’s Forextrader is the fact that you can setup a practice account for learning how forex trading works. The app has a nice dashboard that summarizes Balance, Positions and orders. The Trade part of the app shows you real-time stats on the minute, which is something every app offers, but we like the way it is displayed. For the Tools part the app includes Market updates, recent news and forex insider tips. The Economic calendar shows real-time country stats such as unemployment rate or PMI Manucaturing index. The report section of Forextrader is also quite impressive: You always can pull recent activity, Realized P&L, Rollover history and obviously order history. Overall a great app for beginners and professionals, who like to be on the pulse of Forex trading. First thing we didn’t like about Metatraader is the fact that they ask you for your phone number. We’ll drop our CC, but I don’t think that for a practice account you should be required to give away your cell number. Once logged in we were also kind of confused with the setup of Meta trader. The dashboard was a bit confusing, but after reading on their website, it was clear to us how to use it. Trix and Trema indicators are a nice feature and the charts look good once setup right. Overall the app however is for professionals and not beginners, which we’d like to recommend it only to people, who have trading experience. FXCM is clearly one of the global market leaders in Forex trading. There app is intuitive and beloved by a lot of people. The app also offers market news and allows to deposit fund and to place market order. Their charts are also up to date and in real-time. Micro clients will be charged $0.10 per micro lot per trade. 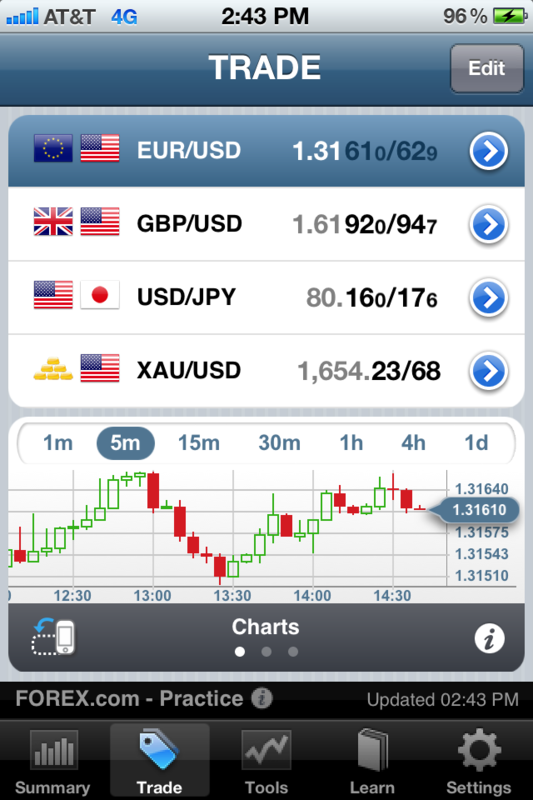 The Easy forex Iphone apps shows live rates of over 100 currencies including oil and gold. Besides that standard features, easy-forex has an inside viewer that let’s you see which currencies are most popularly traded. 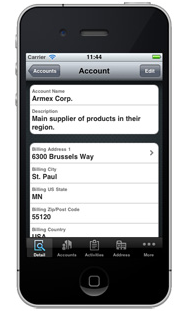 On top the app gives you a weekly outlook, so you can prepare yourself before putting new orders in. Forex on the Go’s best features is the ability to use it without signing up or creating an account. Once downloaded the app works and you can instantly use it. 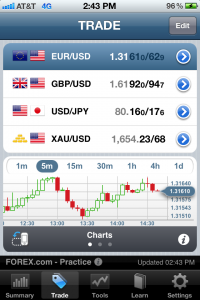 All apps seem to cover the basics and can help you understand your Forex needs. Some apps need more time to get used to, but they all do a well job to get your needs covered. It’s quite interesting to see musicians nowadays have to get in the app market in order to not loose distance with their fans. David Guetta one of the most famous DJs in the world now has an app, which gets managed by his recording company. The app basically replaces the website, which is a trend that we’ll see moving forward in the next few years and possibly Google’s downfall (and probably the reason why the push Android and Google+ so hard). It’ll be the sickest game changer for mobile. But only…if it works!